Here’s another injustice, this time nothing to do with Israel. Also this week Mike put up a post about how the Tory council at Windsor had got around the ban on their plans to clear the beggars off the streets of their borough. The plans had been shelved due to massive public outrage. But Tories are Tories, and so they’ve come up with a plan to get round it: they had the cops come round to seize their possessions, meaning their sleeping bags, and put them in storage, so they couldn’t sleep on the streets. This was supposed to be ‘helping’ them. I can remember a political commentator stating that we now live in an age of ‘inverted totalitarianism’. In the past, the dictator or the authorities in a totalitarian state told people what to do, and the penalty for not complying was brutally clear. Now the authorities also dictate to you, but do it with mealy-mouthed words about helping you. You can see the same process at work in the sanctions system and work capability tests. Oh no, we’re not leaving people to starve to death, or commit suicide out of despair. We’re incentivising those that can to find work. Look, so far we’ve helped all these people find jobs. This was followed by statistics, that actually showed you had a better chance of finding work if you didn’t go on their wretched workfare programme. And the same lying verbiage used to give a veneer of humanity to the Tories’ murderous welfare reforms has been adopted to clear the beggars off the streets. And this is especially hypocritical today, because many of the well-wishers come down to cheer on the royal couple at the wedding today were camping out on the streets. Which is illegal, but no-one was moving them on. Here’s Chunky Mark making his comments about this, and the Tories wider policy about supporting high house prices for the benefit of rich vulture capitalists in tax exile in Bahamas. He argues that it’s all about pushing down at the people at the bottom of society. They need homelessness and deaths, like the 78 homeless people, who died last year, to keep house prices high in accordance with the law of supply and demand. This is another excellent piece from RTUK. And it shows why we’re better off looking at alternative sources of news on the Net than relying on flagrantly biased BBC. Even when those alternative sources are owned by Putin’s Russia. This report discusses the true scale of hidden and rural homelessness in the UK, which is much bigger than previously considered. Among the chilling statistics, it reports that 1 in 10 people experience homelessness every year, and that homelessness has increased 50 per cent since the Tories took power in 2010. In London, 12,500 people are forced to sleep on sofas or the Tube every night. Nationally, 70,000 people were sofa surfing, 20,000 people sleep in unsuitable accommodation, 12,500 living in squats, 9,000 living in tents. A spokesman for Centrepoint states that the statistics are patchy and unclear, and that homelessness is often unreported by the general public, because they don’t know the homeless people they see sleeping rough. This prevents it from gaining the attention it needs to attract proper political action. Not all towns deal with the problem in the same way. While most councils try to get the homeless into a hostel or similar, Carlisle is trying to solve the problem by giving the homeless tents, toiletries and other things they need, a policy which is praised by one homeless man, a Mr. Dubka, interviewed on the programme. The programme does report the government’s response, which says that it is committed to tackling homelessness and has devoted £550 million to this goal by 2020. The government is also about to pass the Homelessness Reduction Bill intended to force council to act in cases where people are about to become homeless. But councils are still finding it difficult to cope, as budgets have been slashed by 70 per cent from 2014, councils are forced to concentrate on the urban centres, a point supported by a spokesman for another charity, Porchlight. The programme also cites statistics collected by Herriott Watts University. It concludes that on the one hand, it’s good that the figures for rural homelessness are finally being included and pressure is being placed on the government to include them in its Homelessness Reduction Act, but on the other funding is still being reduced. I am not surprised that there are a high number of ‘hidden homeless’ in London and around the country. A little while ago I found a study of homelessness in New York, written by an American social scientist and based on his doctoral research in the 1980s and 1990s, when it was briefly a major issue in American politics. It’s actually more difficult to define the scale of the homelessness problem in New York, because many of the homeless aren’t living on the streets. They are sleeping on friends’ couches, or in basements or closets or other areas given to them to sleep in by kindly janitors. And although the problem is much bigger in the 21st century than it was twenty or so years ago, it has practically disappeared as a political issue. Many of those homeless in New York are graduates. I wonder how many are also people with university degrees in this country, who can’t find accommodation in the cities in which they moved to attend uni, because of a shortage of affordable housing. The report also makes another excellent point, though one by tacit demonstration rather than open statement. The government has said that it’s devoting £550 million to the problem by 2020. This looks impressive, but as the programme shows, this is actually a cut of 70 per cent. It shows why you should be always very careful about accepting the government’s stats when they are given in isolation without corresponding data to compare it with. Also, whatever they say, this government will do the barest minimum to tackle homelessness. Due to Tory policies, the wider British economy depends on house prices remaining high. And they can only remain high if there’s a demand for them. The leak last Thursday of the Labour party manifesto, with its promise to nationalise the railways and parts of the energy network, clearly has rattled the Tory party. Mike over at Vox Political remarked that leak was probably intended to discredit these policies, but instead they have proved massively popular. I’m not surprised. The Tory party, of course, started shrieking that this would drag us all back to the 1970s – actually not a bad thing, as Mike has also pointed out, considering that the gulf between rich and poor was at its lowest during that decade. The Torygraph also went berserk, and plastered all over the front page of its Friday edition a headline claiming that Labour MPs were ‘disowning’ it. I don’t know how true this was. It could be the Blairites trying their best to undermine their own party again, in order to shore up virtuous neoliberalism. Or it could be just more rumour and scaremongering put out, as usual, by the rag and its owners, the weirdo Barclay twins. The Telegraph has been in the forefront of the newspapers attacking Corbyn since he was elected to the Labour leadership. So many of its stories are just scaremongering or, at best, the fevered imaginings of a frightened capitalist class, that you can’t really believe anything the newspaper actually writes about the Labour party or its leader. Ken Surin, in an article for Counterpunch, quoted statistics by media analysts that said that only 11 per cent of reports about the party presented the facts accurately. But the fact that the railways do need to be renationalised was ironically shown again that day, as a train I wanted to catch was delayed by 15 minutes. Because a train had broken down. The British taxpayer now pays far more subsidies to the private rail companies for a worse train service than in the 1970s. So once again, we’re back to showing that rather than being a decade of uniform disaster and imminent social collapse, it was better in some ways than the present. So May has decided to unveil a few radical policies of her own. In order to counter Labour’s promise to build a million new homes, half of which will be social housing, in the next five years, May has announced that her government will boost the number of social housing being built, and included a special right to buy clause. Which sounds good, until you realise that they’re not going to release any more money for it. Without that extra money, the promise is meaningless. The Tory party has absolutely no intention of building any more social housing. Mike has put up in his article a table of the Tories’ abysmal record on housing. These include a 43 per cent increase in homelessness, a 166 per cent jump in the number of people sleeping rough, private rents have gone up by over £1,700 since 2010, and the cost of owning a home for first-time buyers has risen by £65,000. But this won’t worry the Tory party, as 1/3 of them are private landlords. And I distinctly remember Johnny Void posting a number of articles about they sought to profit by the dearth of housing in London. And this is quite apart from the fact that the Tory press, such as the Daily Mail, is aimed very much at the kind of people, who buy to rent, and endlessly applauds high house prices even though they make homes unaffordable to an increasing number of people in 21st century England. Of course they see such prices as a good thing, as it means even greater profits for them. So they won’t want to undermine the housing bubble they’ve created, and cause prices to fall by building any more. But they can’t be seen to be doing that, with Corbyn and Labour hot on this issue. So they’ve concocted this rubbish, self-contradictory policy, hoping that people will be deceived by the meaningless promise. They hope people will remember the first part, and forget that without any more money, it won’t happen. Vote Labour for a decent housing solution on June 8th. This is the sharp edge of ‘caring Conservatism’. 2015 will be the third year running that Vox Political has run an article on the number of children who will be homeless at Christmas – and, for the third year running, the total has increased. In 2013 it was 87,000 – 7,000 more than predicted by the charity Shelter. In 2014, the total had increased to 96,000. This year, the charity expects more than 100,000 children to be homeless. “You may not see them on the streets, but they’re still homeless. Because they don’t have homes, they’re living in places like hostels and B&Bs. “A child’s Christmas should be exciting – eating too much, playing games with family… Wondering if they’ll see the presents they wished for under the tree. “But 100,000 children might not even have room for a tree – let alone space to sit around a table for Christmas dinner. Plus, their temporary accommodation might be hundreds of miles away from family and friends. “Can you imagine spending Christmas homeless, away from what you know? These children won’t have to – it’s reality. “100,000 is a hard number to get your head around – it’s the equivalent of four in every school in Britain. Mike then goes on to say, what Shelter doesn’t – that this is due to the government’s welfare and economic policies – cutting benefits, boosting house and rent prices while cutting wages. His article also has a link to Shelter’s website, which collecting to help the homeless. The article’s at: http://voxpoliticalonline.com/2015/11/03/another-victory-for-tory-social-policy-100000-children-will-be-homeless-this-christmas/ Go and read it, and be appalled. This should be another major issue, just as it should have been last year, and the year before. But it isn’t. And it probably won’t be, either, unless there is a concerted campaign to keep this issue in the public consciousness. The Tories and local authorities are doing their best to clear the homeless off our streets, so we don’t see them. And, as the saying goes, ‘out of sight, out of mind’. With the homeless invisible, it’ll be possible to forget all about the issue, and get taken in by the lies that it somehow doesn’t exist. It exists, and it’s growing. This is another video I found on Youtube, which, although it comes from a different country a continent away, nevertheless is relevant to what’s happening in Britain now. It’s by an Ozzie bloke attacking the way Mike Baird, the Liberal premier of New South Wales, has passed legislation allowing the mining and fracking companies to operative irrespective of the immense ecological damage they cause. This includes pumping 20 different toxic chemicals into the ground. Apart from creating a mountain of salt 11 km long, it’s also threatening to poison forever Australia’s precious farmland and the Great Artesian Basin. The video’s producer, Friendlyjordies, points out that only 4 per cent of Australia’s massive landmass is farmland. So it’s obvious that polluting what little farmland the country has available is immensely stupid. As for the Great Artesian Basin, this is the massive underground lake that supplies water to much of the eastern part of the Australian landmass. Much of the water supporting Oz’s ecosystem comes from this underground lake, which last fell as rain thousands of years ago. Poisoning this immense water source is therefore not only immensely stupid, but could effectively turn much of Oz into a polluted desert. Not counting the fact that the contracts allow frackers to drill near Sydney’s cataract falls, and are causing house prices to fall in the great metropolis itself. It’s the same justifiable fears about the effects fracking will have over here in Britain. And some of the issues are the same – farmland being seized and polluted through fracking, contamination of groundwater through toxic chemicals, fracking near towns and affecting the property of private citizens. Even the political complexion of the government doing all this is similar. The video states that Baird is a Liberal, who has helped the Conservatives do this. Like Nick Clegg has supported the Tories here in Blighty. I don’t know if the companies involved are the same, but I wouldn’t be remotely surprised if they were. I’ve no doubt that they have their supporters in the British press. Way back in the 1990s the Torygraph was complaining about how racist and unfair it was for the Ozzie government to ban uranium mining on Aboriginal land. I think press support for fracking globally is pretty much a foregone conclusion from the Murdoch press. Even if the companies mining over there are different from those wanting to frack over here, I’ve no doubt that some of the personnel and PR people are the same, or in very close contact with each other. In the same way that Cameron’s spin doctor, Lynton Crosbie, also hails from Down Under. Even the rhetoric of political blame to justify the fracking programme is the same. The video states that there are people trying to excuse the Liberals and Conservatives fracking, because ‘Labor started it’. The vieo shows that the present Labor opposition in NSW actually wants a moratorium on fracking. It’s similar to some of the comments Mike has had to refute over at Vox Political, that the British Labour party are just as much in favour of it as the Tories, because they insisted on legislation restricting it, but not prohibiting it. A total prohibition would probably have been the better policy, but as Mike points out, it stood no chance of getting through. It’s now a globalised, deeply interconnected world, where what happens in one country impacts on what they do in others. And the same things are going on across the world, in America, Britain and Australia. We have to learn from and stand together in order to resist it. Homelessness, Evictions and Revolution: Ireland, 19th century; Britain, 21st? 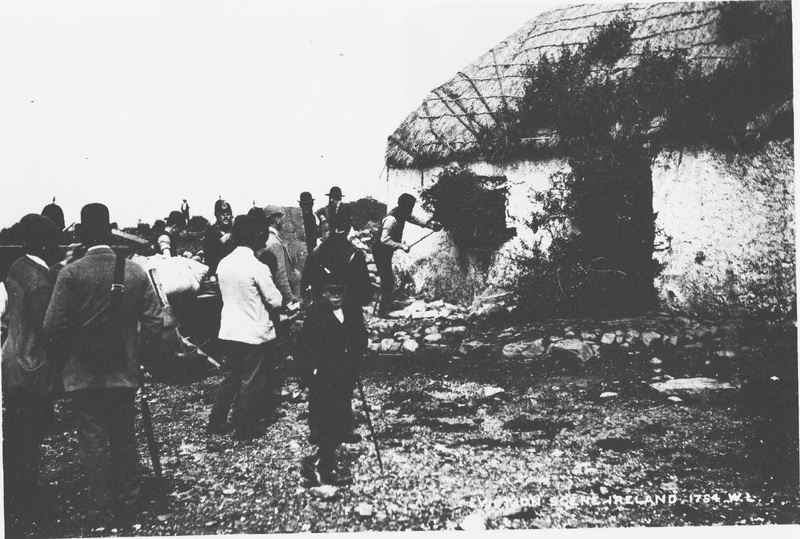 Evicting a peasant from his holding: the poverty-stricken Irish peasantry’s resentment of prosperous English absentee landlords was just one contributory factor in the unstoppable demand for Home Rule and the dissolution of the Union of England and Ireland. The oppression of the Irish peasantry through heavy rents and the eviction of large numbers, who couldn’t pay, created bitter resentment that did indeed contribute strongly to the demand for Home Rule, popular uprisings and Fenian – Irish nationalist – terrorism against the British. And I wonder how long it will be before the Tory cuts and the mass poverty they have caused in Britain will lead to the same resentment and violence in the UK. Many people now in Britain also feel alienated and abandoned by a political class that appears isolated and out of touch with the needs of the British people themselves, and concerned only with the further enrichment of the extremely wealthy through further privatisation and tax cuts. The government’s austerity programme has led to a level of starvation in the UK not seen since the 19th century. Rising house prices have created a ‘Generation Rent’, who have little opportunity to get on the property ladder. And the notorious ‘Bedroom Tax’ and prohibition on the further construction of council housing have seen people forced out of their homes and into Bed and Breakfast accommodation and hotels, simply because they can no longer afford the rent on their council houses. And as the rich get richer, British cities like London are seeing a social cleansing as the poor and working class are forced out to the suburbs and less expensive towns as they are priced out by the rich. If these policies continue, the resentment and alienation felt by the poor, working and lower middle class in this country will get worse. And the celebrations up and down the country last year of the death of Margaret Thatcher show just how long and deeply such bitterness can and will last. Thatcher was overthrown by the Tories in a cabinet coup in the first years of the 1990s nearly a quarter of a century ago. You can only push people so far before the bitterness and resentment turns to violence. The shooting of Mark Duggan in 2010 resulted in rioting, and it only needs more incidents like that to cause further unrest. Boris Johnson is clearly worried about it, otherwise he wouldn’t be trying to purchase two second-hand water cannons from the Germans. And one of the causes of radical resentment in the Federal Republic was the death of a protester after being hit by water cannon during a riot in 1969. I’m not saying that violence, rioting and terrorism will inevitably occur. The popular mood at the moment seems simply to be one of sullen resignation. Nevertheless, if people are left without hope, and the government appears too distant, self-interested and arrogant, the potential is there. The existence of formal parliamentary democracy may not make much difference, if people feel that there is no real choice, or there is a continued dominance of one political party. It is believed that if Scotland secedes, the result will be a decline in the number of Labour MPs, with the result that future government are likely to be dominated by the Conservatives. The existence of democracy in Northern Ireland in the 1970s and 1980s did not prevent the revival of Irish nationalist terrorism, because the dominance of the Unionist party meant that the Roman Catholic population did not feel that their grievances and institutional oppression against them were being addressed. It may therefore not be long before a similar situation arises in Britain and England, where large number of the poor and working class feel they have no alternative for making themselves heard except through violence and acts of terror. I don’t want that. There’s been enough bloodshed in British history already. Hopefully this can be prevented before it’s too late. The ‘Bedroom Tax’, Workfare, and cuts to welfare benefit all need to be scrapped, and a government elected determined to create real jobs, rather than just the illusion to serve the corporate interests of wealthy donors. It needs a more representative parliament, with members drawn from the working and lower middle classes, rather than the professionals and lawyers, who now predominate. And certainly not the Eton-educated aristos now forming the present cabinet. Only in this way can we stop, and possibly just begin to reverse, the bitter resentment and hatred now forming against Britain’s out of touch, complacent and exploitative elite. A resentment that if it goes further will lead to violence and bloodshed that may last decades.